Will I benefit from using the Theradome® LH80 PRO helmet? A minimisation and slowing down of hair loss. Please bear in mind that results will vary from person to person dependent on hair state when beginning treatment, age of onset, general health and underlying medical conditions. If you are unsure the cause of your hair loss, we highly recommend visiting a registered Trichologist for a consultation and diagnosis before embarking on treatment with laser phototherapy. How long until I notice some results? Step One: Between 4 – 18 weeks hair loss can be minimised. Step Two: Between 18 – 26 weeks reversing miniaturisation occurs. Step Three: 26 – 52 weeks renewed hair regrowth occurs. Please remember that each user is an individual and therefore results may vary. How do I use Theradome®? The Theradome® LH80 PRO helmet is extremely user friendly and is operated via a single, large power button on the back of the helmet. Once you have switched the helmet on Theradome® directs you with its audio voice which tells you; if the battery is low, when the treatment has ended, how many Theradome® treatments you have completed in total and if your helmet is experiencing any technical issues. Are there any potential side-effects that I may experience after use? Rest assured that there are absolutely no side-effects which can be experienced through use of the Theradome® LH80 PRO helmet. Our product has been fully cleared by the Food and Drug Administration (FDA) in America for use by both men and women. It also carries the CE Mark which means that it complies fully with EU safety, health and environmental requirements for medical devices. 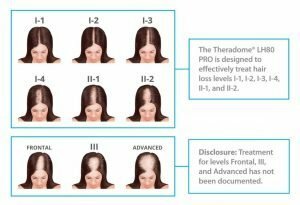 Is the Theradome® FDA cleared? How do I determine if the Theradome® LH80 PRO is the right treatment for me? Laser Phototherapy can be beneficial for hair loss at any stage. However, the sooner you start treatment the better the outcome can be. With regards to male hair loss the Norwood Scale is most commonly used to determine the stage and pattern of receding hair loss. For female hair loss there are several scales used. The most commonly used is the Savin Scale, as this measures the overall thinning in addition to pattern of hair loss stages. Please view an example of the Savin Scale below in order to assist you with determining which stage of female hair loss you may be experiencing. What is the best way to track my treatment progress? 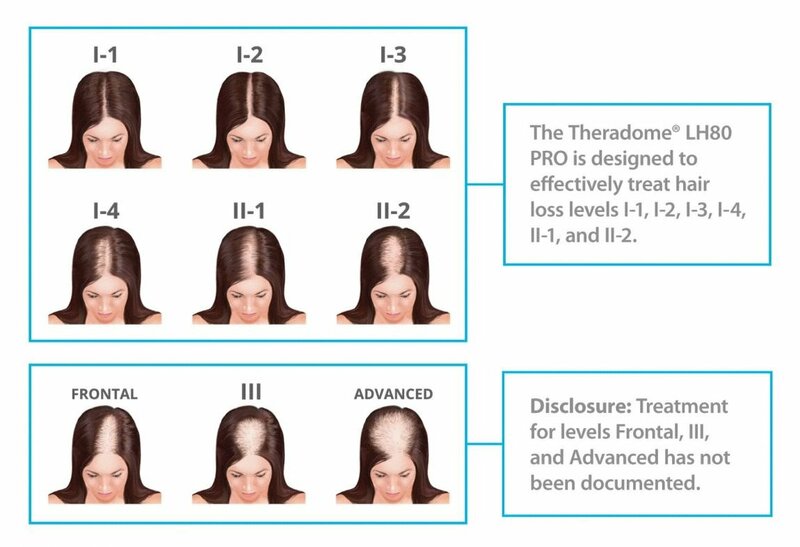 Keeping a visual photographic record of your hair loss prior to treatment and at regular stages during Theradome® treatment, will allow you to track your hair regrowth treatment progress. Further details, including a before and after photo guide can be viewed via our sister American Theradome® website.